In a hangar that used to house Sweden's most fearsome fighter squadrons near the rather ordinary airport in Angelholm, Sweden, one of the world's most exciting car companies makes tarmac-destroying cars out of carbon fiber and madness. Welcome to Koenigsegg. As part of our trip to Koenigsegg, we got free reign to wander around the factory and check out whatever we wanted. GFWilliams took these photos to show just what being in one of Europe's most amazing car factories is like. This factory isn't Koenigsegg's original building. A few years ago, their first factory caught fire on a weekend. Luckily, the staff that was there was able to salvage almost everything, including cars and machinery. They moved across the runway to this building, which housed one of Sweden's most legendary fighter squadrons. Their symbol was a ghost, and Koenigsegg promised them that as long as cars were built in this factory, they'd have the ghost emblem on board. That's why there's a ghost on the rear window of every car they currently build. This isn't an a-typical scene when you arrive. Just Christian von Koenigsegg's Tesla Model S parked behind a CCXR outside the factory. It's a normal day. Another CCX greets you at the entrance, and that's when you notice a number of cloaked figures just nearby. It's a full ten percent of the total Koenigsegg production (and one Gallardo). Koenigsegg keeps a number of customer cars in storage through the winter months. The cars are also here to receive upgrades or repairs. One had a slightly scuffed roof as it wasn't fastened properly and flew off at speed. Whoops. There's also this, the CCR that went 388 kmh at the Nardo Circuit in 2005, breaking the speed record for roadgoing cars in the process. This Agera is the test mule for all of Koenigsegg's cars. 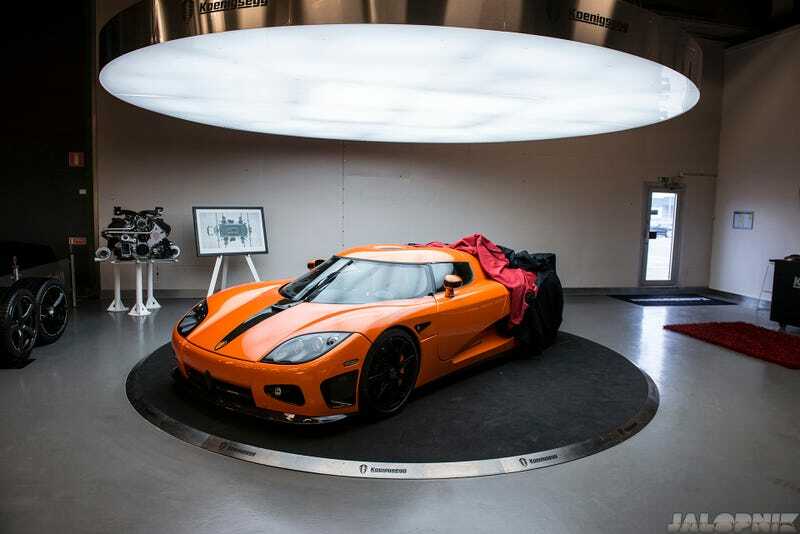 It's the one that was filmed for Need For Speed and is also a test bed for the One:1. Looks sinister with no headlights. Here's where all upholstery for the cars is done. At the time of our visit, they were working on the One:1 interior, which had memory foam seats. Right next door is the engine room with a complete dyno. These are some turbos they had been experimenting with in the past but aren't currently using in cars. All carbon fiber work, including wheel production, is done in house. This room was a carbon fiber treasure trove. Front clips of Ageras and One:1s were all there, awaiting paint and assembly. This is an unpainted One:1 front bumper, you can tell because of the small slits that are cut out to accommodate the aero additions that have been made to the new car. The team working diligently on the One:1 on the production line. Oh, y'know, just a diffuser hanging around. Really nothing to see here. This Agera S was bound for the Geneva Show, but it needed to be detailed first. And detailing a Koenigsegg is not a two hour job. We spoke to the detailer, who said he spends 50 (!!!!!) hours on each car. It was mesmerizing to watch, and he was amazing at it. The results speak for themselves, the car looked spectacular when he was done. No swirls at all, just smooth as glass paint. Some of the greatest detailing work I've ever seen. Koenigsegg might not be a large operation, but being able to do everything under one roof for a company that could still still be considered in a fairly nascent state is incredibly impressive.